Fagin’s Twist is the untold story of a notorious and complex villain. 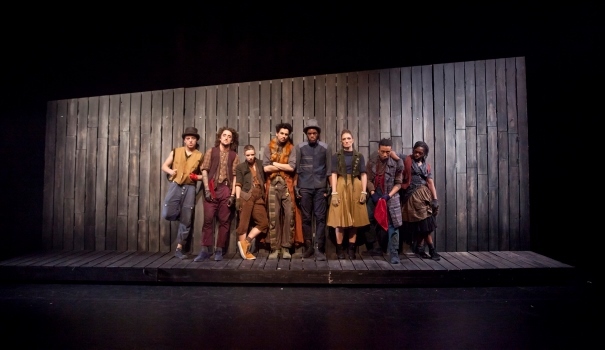 It imagines Fagin’s youth, driven by greed and ambition in the face of overwhelming poverty. The streets are a place of little comfort and fairy-tale endings are hard to find in this piece of poignant coming-of-age dance theatre. Oliver Twist – The novel’s protagonist. Oliver is an orphan born in a workhouse, and Dickens uses his situation to criticize public policy toward the poor in 1830s England. Oliver is between nine and twelve years old when the main action of the novel occurs. Though treated with cruelty and surrounded by coarseness for most of his life, he is a pious, innocent child, and his charms draw the attention of several wealthy benefactors. His true identity is the central mystery of the novel. Fagin – A conniving career criminal. Fagin takes in homeless children and trains them to pick pockets for him. He is also a buyer of other people’s stolen goods. He rarely commits crimes himself, preferring to employ others to commit them—and often suffer legal retribution—in his place. Bill Sikes – A brutal professional burglar brought up in Fagin’s gang. Sikes is Nancy’s pimp and lover, and he treats both her and his dog Bull’s-eye with an odd combination of cruelty and grudging affection. Nancy – A young prostitute and one of Fagin’s former child pickpockets. Nancy is also Bill Sikes’s lover. Her love for Sikes and her sense of moral decency come into conflict when Sikes abuses Oliver. Despite her criminal lifestyle, she is among the noblest characters in the novel. The Artful Dodger – The cleverest of Fagin’s pickpockets. The Dodger’s real name is Jack Dawkins. Though no older than Oliver, the Dodger talks and dresses like a grown man. He introduces Oliver to Fagin. See Dickens’ Oliver Twist in a new light as Tony Adigun’s Avant Garde Dance Company flips your expectations of these five familiar characters, with their unmatched contemporary hip hop style. Thursday 22 & Friday 23 September.